Arranging and following up the tasks of the organization, is an essential action and should be done frequently by the managers. This tool of Hyper, allows the user to create and share new tasks as well as follow up the rest of the users tasks. 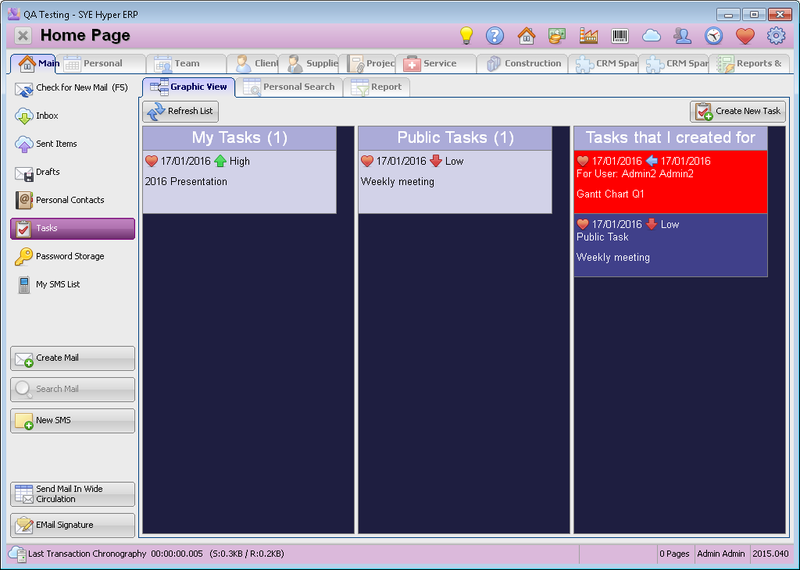 Each task can be related to Client / Supplier / Project cards or alternatively to internal users and departments only. Graphic View - This tab displays the entire tasks related to the user: Personal tasks, Public tasks, Tasks that were created for others. Personal Search - Allows the user to search for any self related task, by using the filter fields. Report - This tab is used to create a Search Wizard to find any required task and export or print it. This page also allows to create a new task. My tasks - All of the personal tasks of the user, which are not public. Public tasks - Tasks that were defined as public for Everyone / Department / Agency. Tasks that I created for Others - The tasks that were created by the user for other users. Double click on a task will open the task window, that allows the user to modify and the task and update its status according to the defined authorizations. - Waiting on someone else. Tasks that should be completed by today, will be marked with a red background. Priority: High priority. Low priority. Related Users / Contacts / Clients / Suppliers. ("For User" field). The list of fields to display in the task frame, can be modified be the user. In order to choose the required fields, right click on the task frame and choose "Personal Fields Layout". In the "Personal Fields Layout" window, the user can choose the required fields from the list of available fields. Additional fields can be chosen by using "Tab" or Ctrl+Enter. Refresh List Refresh the list of tasks according to updates and modifications. Create New Task Create a new task (as described below). This tab allows the user to search for any self related task, by using the filter fields. Search Search for tasks according to the defined filters. Clear Clear the filter definitions. Print Print the searching results. Export Data Export the searching results. Copy Data to Clipboard Copy the searching results to the clipboard. In order to create a new task, click the Create New Task button. In the "New Task" window, the user should fill in all of the relevant information. Starting At Mandatory field. The timing for starting the task. Deadline According to selected date in this field, the task will be marked with a red background. Linked to If the task is referred to specific Client / Supplier / Project, select its Hyper card. Priority Use this field to define the priority for each task. 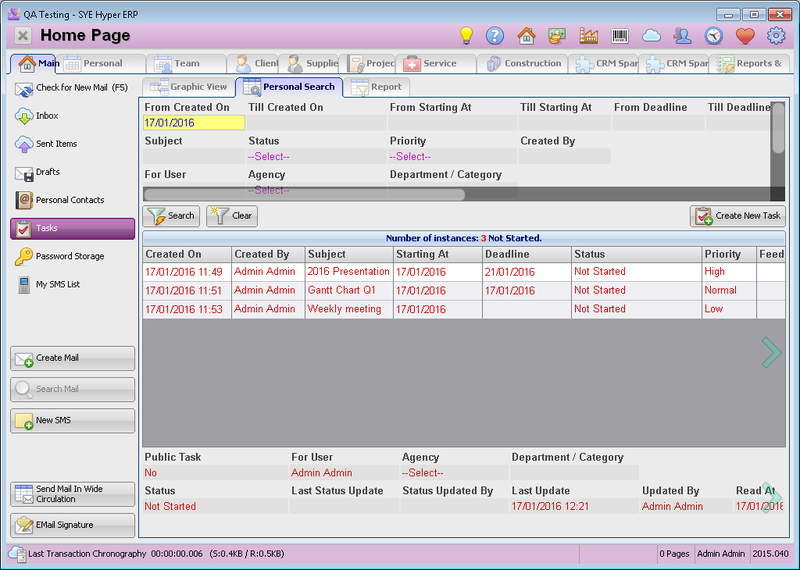 The priority of the task will be displayed in the Grapic View window: - High Priority, - Low Priority. Public Task In this field, define whether this is a private task of the user or a public task, which referrs to another employees of the organization. For User When creating a task for other users, select the user from the "Select User Dialog" in this field. Use the Lock for Cahnges checkbox, to define whether the user can make any changes in the task definitions. Agency / Department These fields are available according to the "Public Task" field value. After creating a new task, it will be added to the list of tasks. 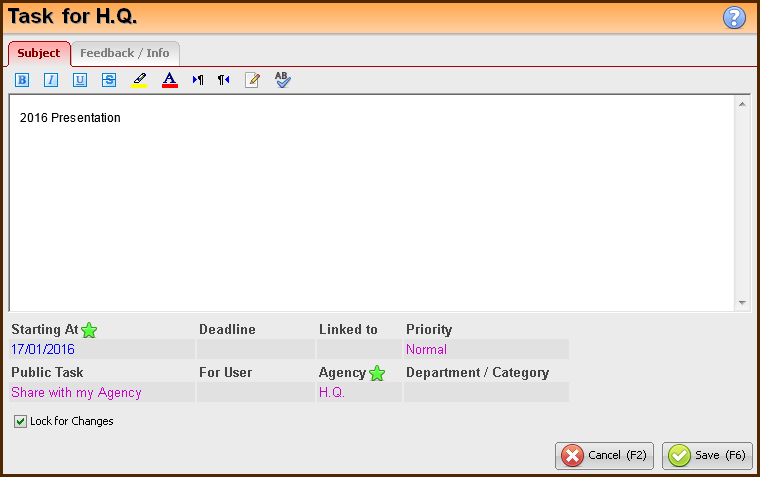 The open tasks are also displayed in the Alerts List at the top of the window.